With the start of the college football season only 22 days away, football fans have become increasingly excited about the upcoming year. As the season draws near, the Oregon Ducks have been preparing themselves for another outstanding season. The recent news of Thomas Tyner’s surgery has left many wondering how the team will make up for his absence. There has been talk of how roles will be shifted with many people bringing up Byron Marshall and how he will contribute. 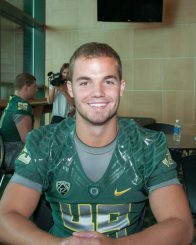 However, one player who has more certainty about his role for the team is place kicker Matt Wogan. The 2015 season will be Wogan’s third with the Ducks. 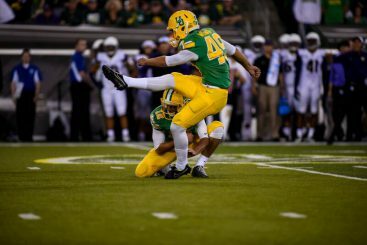 The junior from North Carolina was responsible for 87 of Oregon’s 123 kickoffs last season with 22 recorded touchbacks. Wogan, who returns after some injuries last year, knows that every athlete runs the risk of injury when he steps out onto the field. For some, the injury is career-ending, while for others it is a setback that can be used to push them to better themselves. Wogan fell into the latter category. With both a back injury and a concussion his sophomore season, he missed a solid chunk of playing time. That led him to want to better his game for this year. “The off-season has been tremendous … I’ve grown big time with my game mentally and physically,” Wogan said. Coach Helfrich on the sidelines for game day. One way that Wogan keeps himself focused on bettering himself is through head coach Mark Helfrich, who has a clear focus on the team and “the process.” This process is something that Wogan uses to mentally push himself past the adversities that he has faced. “Trust the process and keep digging,” Wogan stated on how he keeps himself on the path toward a successful season. In addition, players often look to fellow teammates to help them achieve success. Wogan has found inspiration from his former teammate wide receiver Keanon Lowe. It is the mentality and structure of the team that allows for players such as these two to have such a solid relationship. Through the past years that Wogan has been a part of the team the Ducks have experienced tremendous accomplishments both on home turf and away. Although he has been a part of many memorable moments, his favorite seems to be one shared by many other Oregon fans — the winning of the 2015 Rose Bowl. “To come here and win a Rose Bowl and go to the National Championship … you feel like a champion,” Wogan said. Despite being injured last season, Wogan put up some notable stats. This place kicker was 5-for-5 when it came to field goals in the 20-to-29 yard range. 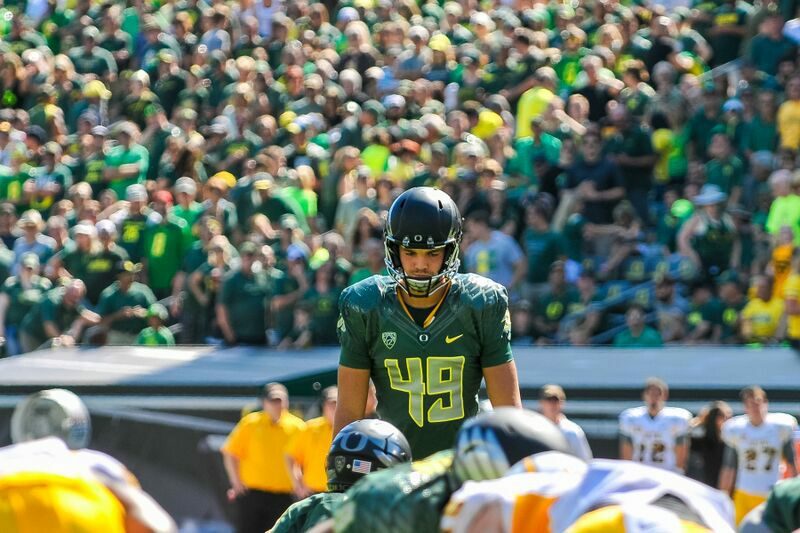 His season’s longest was 34 yards, a kick which helped the Ducks win a hard-fought game against Washington Sate. Even in his first season with the Ducks, he was Oregon’s third-leading scorer with a total of 63 points. Matt Wogan making a great kick in his throw back jersey against the Washington Huskies. 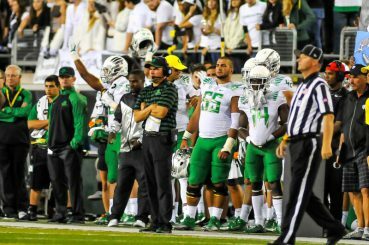 While many are second-guessing the Ducks following the loss of Mariota and the unclear decision of who will be the next QB, the team still appears as strong as ever. “If they need me to punt, then I’ll punt. Whatever they need me to do, I’m ready for it,” asserted Wogan. No matter where coach Helfrich uses him, this Duck is ready for another impressive season.